I was around at the Lord Mayor's pad at the weekend for the third Whisky Live Dublin. Good times. The room was full of people who had carved out a day to chat about nothing but whiskey and there was more tasty liquid than you could shake a Glencairn nosing glass at. What's not to like? I got to try a couple of recent whiskeys that I've written about but had yet to sample, like the Teeling Silver Reserve 21yo (slightly peaty, to my surprise) and Palace Bar Fourth Estate (really smooth with a spicy punch at the end), both single malts, both excellent. On the non-Irish side of the Beam portfolio local distributors Barry & Fitzwilliam had Jim Beam, Knob Creek, Makers Mark and Canadian Club (and perhaps more that I don't recall). All good stuff but it would create a bit of a talking point if they sourced something unusual from the back pages of the Beam catalogue, like Bookers (or even Red Stag Spiced, which I'm keen to try). Even if there is no plan to distribute them here. Irish Distillers put on a great display again with its expanding range of pot stills. Announced just before Whisky Live, Redbreast 21yo was still causing a lot of buzz. Something I'm still thinking about days later is the RubyBlue Chilli Pepper Liqueur. It's grain spirit infused with chillies (which are still in the bottle when you buy it). It has a very clean, fresh flavour and a fairly hot kick behind it. RubyBlue's Barbara Hughes recommends a splash in hot chocolate. You might know RubyBlue under its previous incarnation, Boozeberries. The three original infusions - blackcurrant, wild cranberry and blueberry - are still available, along with the new Chilli Pepper. Noel Sweeney, KDC's Master Distiller, was on hand and as wonderfully illuminating to talk to as ever. Shane Fitzharris, Global Brand Manager at The Irishman, filled me in on the thinking behind the new bottle designs and the differences between the new cask strengths. I met Willie McCarter for the second time (the first time being at the Irish Whiskey Awards) and talked about the work of the Irish Spirits Association. I often refer to Heidi Donelon's Ireland Whiskey Trail site for hard-to-find information about Ireland's whiskey history, pubs, etc. There is something new and very useful on the way from Heidi. I look forward to seeing that. I discussed Riedel glassware, the relaunch of CHQ and the availability of Yellow Spot this Christmas with Jonathan and Robert Mitchell from Mitchell & Son. No hints about Red Spot though! Dingle Distillery shows up at every event where fine Irish craft foods and drinks are showcased, building anticipation for their maturing whiskey. Of course they have their gin and vodka to please palates with in the meantime. Alltech are also filling a warehouse with maturing Irish spirit at the moment but they were pouring their bourbon barrel-matured Kentucky Ale, and Town Branch Bourbon and Pearse Lyons Reserve Single Malt. There was a permanent crowd around the Alltech stand so I didn't even get to say Hi to them on the day. I caught up with their news at the Irish Whiskey Awards though. I've already posted about the new Alltech Dublin distillery. The barrel reuse sequence at Alltech is also interesting. As the laws governing bourbon require, Town Branch bourbon is matured in virgin oak casks. Once emptied, those casks are used for up to 6 weeks to mature the Kentucky Bourbon Barrel Ale. They are then rinsed out and either used to age the Pearse Lyons Reserve single malt or they are sent to Ireland to mature the spirit that is being made here. I have been wondering if the current trend for oak-ageing beer was going to interfere with the availability of ex-bourbon casks for the Irish whiskey industry, or if beer would, perhaps, render subsequent reuse impossible. It seems we don't have to worry, that the casks can accommodate this new use. Will it influence the flavour of the whiskey? We shall see in a few years' time. None of the other new or upcoming distilleries were there. 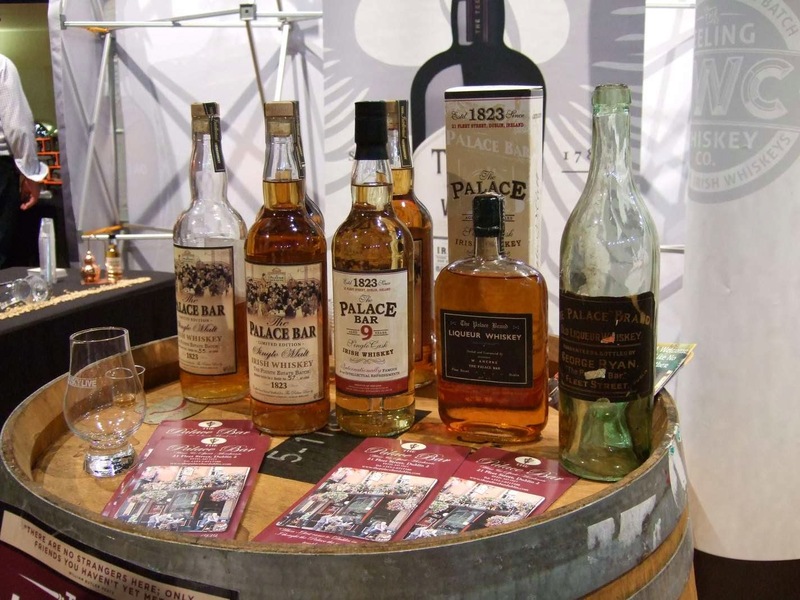 Perhaps it's expensive to rent space at Whisky Live, and of course they have yet to generate a positive cashflow. If any of them are concerned about not having spirit to pour, I would suggest bringing along a heap of chocolate, crisps, or something from the distillery's locale to share, set them atop an upended cask and engage passers-by in conversation. There was a serious dearth of nibbles among all the drink so it would be very welcome. It's never too early to get to know your customers. Showing how it's done, Brooks Hotel were there. We know the guys from Brooks very well at this stage because the Irish Whiskey Society holds its monthly meetings in one of their rooms. They have a huge selection of whiskey in their bar but for Whisky Live they brought along cookies made by their chef, flavoured with elderflower that he foraged himself. How classy is that?! Even is it's only Irish distillers, bars and sellers that turn up, I'm happy. I always leave far better informed about Irish whiskey than when I arrived.